Now Creative - Case Study - My Itchy Travel Feet. Branding and Website exploring the very best in Baby-Boomer Travel Experiences. 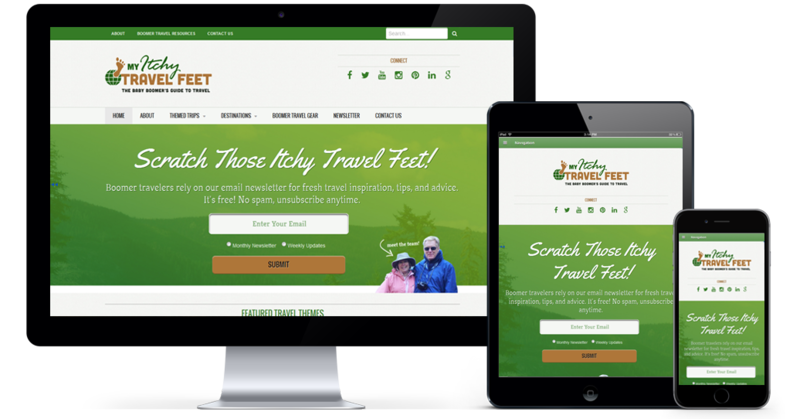 The My Itchy Travel Feet site was tired and dated. Although the content was great, it was falling short of its potential. I was tasked with creating a fresh new facelift which embraced Wordpress as its CMS and provided a responsive solution. Also part of the brief was branding. The branding was weak, infact they didn't really have a logo. They did have a colour scheme however, which had to be maintained in the re-design. There were quite a few components the client wanted included in this logo. Each component hangs off the bold block font which provides a strong focal point. Positioning each item whilst maintaining balance was the biggest challenge.